Brigitte Cornand is a French filmmaker who divides her time between New York and Paris. 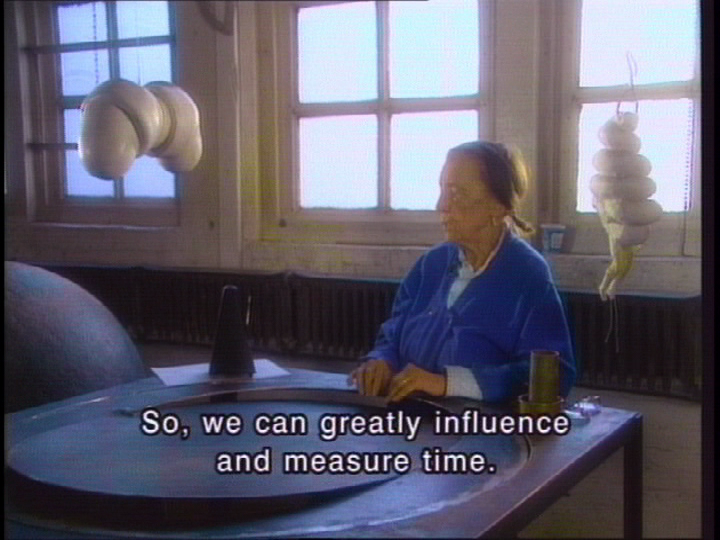 She met Louise Bourgeois in 1994 and in developing a friendship, the two commenced upon a dialogue that Ms. Cornand translated via the medium of film. Having been a former producer for Canal+, a French television channel, in her former life she focused on art programs. A selection of her films will be shown at the French Institute Alliance Française (FIAF) in New York. The screening series titled My Beautiful Women will be shown March 23rd, April 13th, and April 20th, each day bringing several films to large screen format. To say that Cornand’s films are intimate is almost an understatement. They are incredibly revealing in the most pure, yet stylistic way. 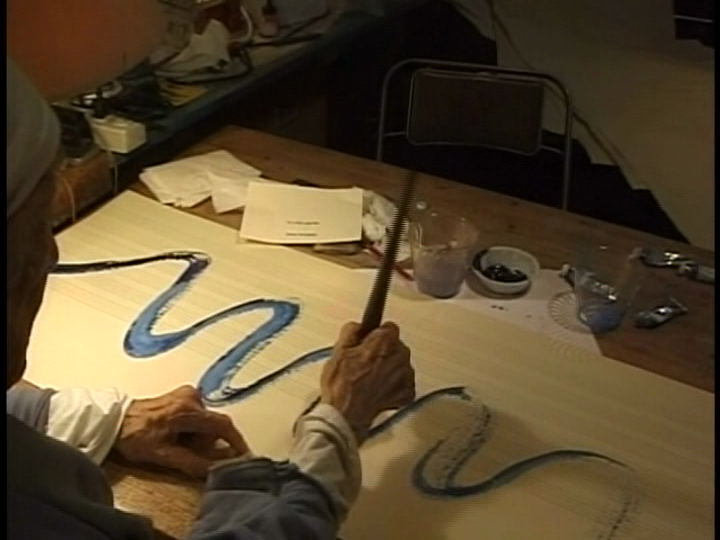 Her final film featuring Louise Bourgeois, Grabigouji: Life of Disappearance (2012), recently had it’s U.S. debut on the occasion of International Women’s Day at FIAF and is a delicately woven documentation of several phone conversations between the late artist and Cornand. The topic of discussion ranges from simple daily banter to the deep and honest admission by Bourgeois of her own recognition of memory loss. The level of mutual trust and visceral comprehension between the two women extends distance and while friendly also carries a particular familial exchange almost as if occurring between mother and daughter. Louise Bourgeois, born on Christmas Day in France in 1911 moved to New York with her husband Robert Goldwater in the late 1940’s, and remained in New York until her death in 2010 at 98 years old. In Grabigouji: Life of Disappearance, we as viewers find ourselves privy to Bourgeois in a state of awareness regarding her own mortality, legacy and the life that she left long ago. Much of the dialogue occurs while Brigitte Cornand is in Paris and Louise Bourgeois in New York. There is talk of when Cornand would next visit Bourgeois in her home, requests for the younger woman to revisit Bourgeios’ childhood home she recalls in specific detail, questions about a particular river that ran through Paris and the hunt for an old friend who we learn has since passed away. In what could be perceived as somewhat voyeuristic, is a poignant documentation ripe with a delicate audio portrayal of human infallibility by way of language, in both English and French. In the film, a final portrait, Cornand chooses to remove Bourgeois from the frame except for a few, blurry scenes whereas the artist is mostly in shadow. Instead, the many phone conversations are pieced together and played while we are shown various room interiors, a backyard and occasional clips of Bourgeios’ own art installations. The film is less of a film and could be more closely compared to a painting, constructed by visual nuances, a montage of movement that is all at once quite still. Without separating Louise Bourgeois or herself for that matter from her film, Brigitte Cornand gives us her glasses so to speak, her lens. In film after film featuring the artist and filmmaker in discussion, we watch Bourgeois through her eyes, observe as she looks through the camera at Cornand. Along the lines of a home movie, a rawness exists that is less about the cinema and more about the visual documentation and life of an individual. 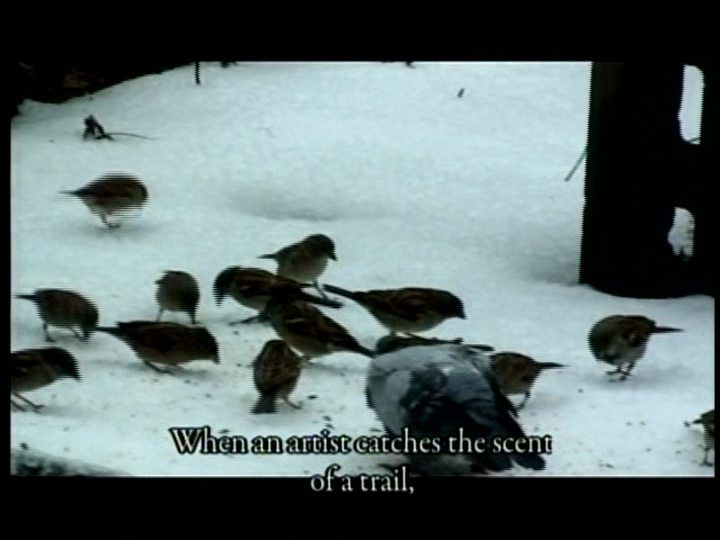 Grabigouji: Life of Disappearance (2012) is one of many films that Cornand made in a continuous dialogue between herself and Louise Bourgeois. However, in the previous films, many which will be shown at FIAF in homage to the artist, Bourgeois herself has more of a physical presence in the sense of documentary. In the final film, it’s as if director and artist dealt with a subtraction of information and spatial affinity as death became imminent. From 1994-2010 Brigitte Cornand made a series of films featuring the documentation of the relationship she shared with Louise Bourgeois. In 1995 there was Dear Louise (Chère Louise), The Whisper of the Whistling Water (C’est le murmure de l’eau qui chante), 2002, The Sweet River (La rivière gentille), 2007, Saint Louise and the Hawk, 2010 and lastly Grabigouji: Life of Disappearance (Grabigouji: La vie de la disparition), 2012. Hers is a visual diary of greatness, a peek into the magical yet eccentric life of a brilliant woman and artist. Louise Bourgeois continued to make art up until a week before her death and much of her working process has been captured in the films. Along with her dedication and fondness for Bourgeois, Brigitte Cornand has also made films that focus on the lives of artists including Annette Messager, Joan Jonas, Jean Nouvel, Jonas Mekas, Kiki Smith and others. She herself could be considered more of an artist than a filmmaker since she isn’t documenting the work of others per se but is instead sharing her own experience with each person by way of film. As part of My Beautiful Women FIAF screened on March 23rd, A Net for Annette (2000), The Sweet River & Saint Louise and the Hawk (2007/2010), Annette Messager, The Messengers (2007) and Andree Putman, Portrait d’interieur (2002). On April 13th they will present Dear Louise (1995), The Red Birds (2009), Joan Jonas: Portrait of The Artist with Dog (2006) and a Meet The Director event will be held featuring a Q & A with Brigitte Cornand, Joan Jonas, Carolee Scheemann, and Martha Rosler. Lastly, April 20th will consist of a tribute to the life of Louise Bourgeois along with screenings of The Sweet River (2007), a Meet The Director event and signing of the book which accompanies the film Grabigouji, to My Friend Louise Bourgeois, a collection of her memories with Bourgeois followed by screenings of The Whisper of the Whistling Water (2002) and Grabigouji: Life of Disappearance (2012). The French Institute Alliance Française is located at 22 East 60th Street, New York, NY 10022. Be sure to click the link above for specific times and programming.